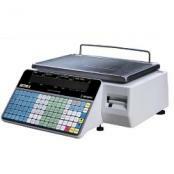 Price computing scales with printer are always available at Central Carolina Scale! Take the guess work out of pricing with CAS LP1000. Designed for long term use, the LP-1000 series is ideal for deli’s, bakeries, candy and coffee shops, convenience stores, produce markets, hardware stores and more. The CAS LP-1000 Thermal Label Printing Scale was designed specifically for the food service environment where you need to pre-pack and price items. 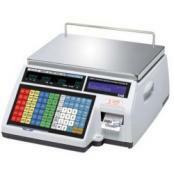 The CAS LP 1000 is perfect for your deli or grocery. Don't forget to buy scale labels too. Detecto's "legal for trade" PC model Price Computing Scales feature a brilliant red display that shows weight, unit price and total price simultaneously on each side of the scale to both operator and customer. Other features include 99 programmable preset prices which are retained in memory when power to the scale is turned off, and a RS-232 serial port for connection to optional label printer. These portable units are perfect for weighing heavier pieces of produce like pumpkins, sweet potatoes or even watermelons! CAS CL5000 NTEP Label Printing ScaleThe CAS Corporation CL5000 Label Printing Scale has the functions you need at an affordable price. Includes CL-Works software package. Use in supermarkets, specialty stores, deli's and more. 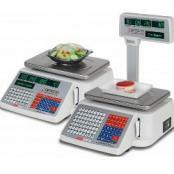 Choice of basic counter top scale (CL-5000B), counter top scale with pole display (CL-5000R) or hanging scale version (CL-5000H). CAS LP1000 NTEP Label Printing ScaleTake CAS's most popular label printing scales, the CAS LP-1000 series, make some improvements, and you have the CAS LP-1000N (counter top) and LP-1000NP (with pole display) label printing scales widely considered the best scale on the market today in its class. A feature rich, easy to use label printing scale. 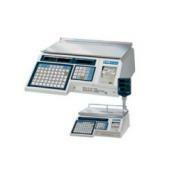 Ishida Astra II Price Computing Scale with PrinterIshida Astra II price computing scale with printer is a replacement for the Ishida Astra label printing scale. The Astra II is engineered for precision and consistency. The Astra II incorporates bright, easy-to-read displays, an easy label loading feature and user-friendly keyboard design, while the ergonomic design enhances customer convenience.